The Lumberton Police Department and the Federal Bureau of Investigation are investigating a child abduction that ocurred Monday morning. 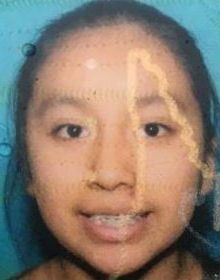 According to the Amber Alert issued by the NC Department of Public Safety, Hania Noelia Aguilar is a 13-year-old Hispanic female approximately 5 feet tall and weighing 126 pounds. She has long black hair, brown eyes and braces. She was last seen wearing a blue shirt with flowers and blue jeans. The abductor is described as an unknown male with a yellow bandana around his face, according to the Amber Alert. They are thought to be traveling on Elizabethtown Road in Lumberton in a stolen green 2002 Ford Expedition with South Carolina license plate NWS-984, according to reports. Anyone who has seen the vehicle or Hania Aguilar, is asked to call the Lumberton Police Department at 910-671-3845 or call 911.